This quirky and characterful detached property , set in tranquil woodlands that can sleep up to five people in two bedrooms. 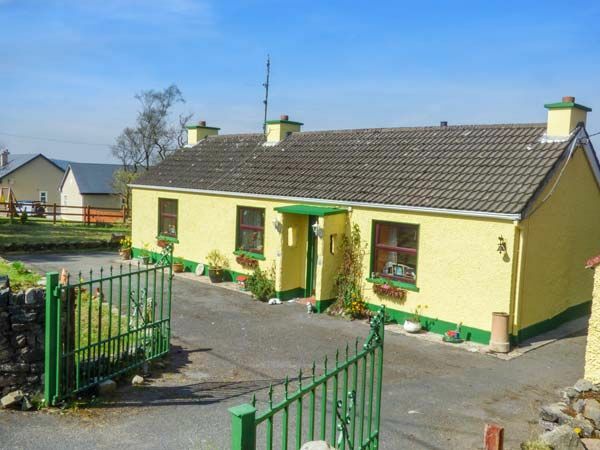 Just 8 miles from the coast, Liffey Ben Cottage is a delightful character cottage set in the Donegal countryside. With accommodation all on one level, the cottage sleeps up to 5 in one double and one double/single bedroom plus family bathroom, 2 sitting areas and a fabulous traditional kitchen/diner. It also features a lovely fully enclosed garden backing onto woodland with parking for 3 cars. Just a short drive from the oldest town in Ireland and the stunning Atlantic coastline, Liffey Ben Cottage is the perfect base for lovers of nature and wildlife who want to explore this beautiful corner of the Emerald Isle. Amenities: Oil-fired central heating plus solid fuel range and woodburner. Electric oven and gas hob, microwave, fridge/freezer, dishwasher, utility room with washing machine and tumble dryer, TV with Freeview, books, radio. Fuel and power inc. in rent. Bed linen and towels inc. in rent. Off-road parking for 3 cars. Enclosed lawned garden with patio and furniture. One well-behaved dog welcome. Sorry, no smoking. Shops, pubs and restaurant 4 miles away. Note: Dried turf for the fire is supplied by owners. Note: Wifi is available in the local pub. Town: Ballyshannon, meaning at The Mouth of Seannach's Ford', is located at the mouth of the River Erne and home to a range of shops, restaurants and pubs.It looks out over the Erne Estuary and has panoramic views of mountains, lakes and forests. All ground floor. Two bedrooms: 1 x double, 1 x family room with one double and one single. Bathroom with bath, separate shower, basin and WC. Kitchen with dining area. Sitting room. Second sitting room. Oil-fired central heating plus solid fuel range and woodburner. Electric oven and gas hob, microwave, fridge/freezer, dishwasher, utility room with washing machine and tumble dryer, TV with Freeview, books, radio. Fuel and power inc. in rent. Bed linen and towels inc. in rent. Off-road parking for 3 cars. Enclosed lawned garden with patio and furniture. One well-behaved dog welcome. Sorry, no smoking. Shops, pubs and restaurant 4 miles away. Note: Dried turf for the fire is supplied by owners. Note: Wifi is available in the local pub.